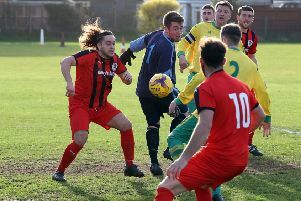 There was heartbreak for Premier Division strugglers Asfordby FC as they were sunk by two late goals from top-three side Thurnby on Saturday. The visitors took the lead through Shaun Barber two minutes before half-time, but Lee Mann’s side refused to lie down and stormed back after the break. Alex Johnson levelled as the chances mounted before substitute Ben Stainsby put Asfordby in front. But there was rough justice for the hosts as Liam Canavan equalised with a minute left and then grabbed a winner two minutes into stoppage-time. “It was heartbreaking for the lads at the end. We were desperately unlucky not to get anything from the game,” Mann said. “The boys outclassed, and outworked a very strong team and were left somehow wondering how it happened. “To come back from a goal behind and create so many chances, on another day we’d be comfortably coming away with the three points. On Saturday, the visitors to Hoby Road are Ellistown who are one place above the bottom three and nine points better off than Asfordby. Kick-off is 3pm. Asfordby: Spencer, S. Wright, Weller, J. Hollis, Ridout (c), Lapworth, Felstead, Clayton, Johnson, Love, Baker, Stainsby, Atherley, Mann.